Searching for a way to sum up ousted the 27-year rule of Burkinabè ex-President Blaise Compaoré, as the opposition gathered on the streets in Ouagadougou last week, a French political analyst settled for 'un pompier pyromane', a firefighter who is also an arsonist. He went on to to explain how Compaoré, with the financial and military support of Libya's Colonel Moammar el Gadaffi, had backed rebellions in Côte d'Ivoire, Guinea, Liberia and Sierra Leone, and had, at best, highly ambiguous relations with insurgents in Mali and Niger. Keeping a discreet distance from the heart of these conflicts, Compaoré would then offer his good offices in securing a 'negotiated peace'. Accordingly, President Ibrahim Boubacar Keïta's government in Bamako has been openly celebrating the downfall of Compaoré. Others, such as the widow of murdered Burkinabè leader Thomas Sankara and human rights activists in Liberia, would like to see Compaoré stand trial for murder and war crimes. France, and latterly the United States, have found Compaoré willing to host their security officials and consequently turned a blind eye to his pyromania. French special forces thoughtfully provided a helicopter to whisk the ousted leader from the presidential palace at Kaysam to an air strip at Fada N'Gouma, eastern Burkina Faso. From there, another French aircraft flew him to the Ivorian capital, Yamoussoukro, where he can enjoy some legal protection, for now. With the exit of Compaoré, there is one less pyromaniac in West Africa but the dynamics of regional conflict have also changed. The state sponsors of war and terror have been eclipsed: Gadaffi is dead, Charles Taylor is in gaol and Compaoré in exile. In their place have come jihadist and nationalist insurgents, exploiting local political failures and tapping into their own networks, ideological and criminal. It was the ousting of Gadaffi and the defeat of his military organisation that unleashed its armoury across the region, providing much of the weaponry for the insurgents. Libya's drama – which now pits the internationally-recognised secular government of Prime Minister Abdullah al Thinni against the Libya Dawn coalition of jihadist fighters and the Muslim Brotherhood led by Omer el Hassi – has not yet played out. If the Islamist fighters are defeated in Libya, many are likely to head south, making common cause with groups such as Ansar Eddine and Al Mourabitoun attacking towns and United Nations peacekeepers in northern Mali (AC Vol 55 No 6, Talking Timbuktu). Chadian President Idris Déby Itno is the one regional leader whose stock looks likely to rise amid this chaos. Having seen off a couple of insurgencies and signed a non-aggression pact with their sponsor, Sudan, Déby has either crushed or outmanoeuvred his political rivals. On the present showing, he's unlikely to face a serious challenger in the 2016 elections. Despite misgivings among some officials in Paris about his record on human rights and corruption, Déby has made himself critically important to France's military operations in the region. Firstly, he sent a couple of battalions of paratroopers to fight alongside French special forces in northern Mali last year. They played a vital role in retaking the country's northernmost city, Kidal, from an alliance of Islamist groups. It was only after the Chadian forces left and disputes broke out between Malian government forces and Tuareg nationalist groups that a fresh round of bombings and armed raids restarted around the city. To the south, Chad is playing a key role in the uneasy regional coalition against the Boko Haram jihadists, whose operations have started to fan out across the border from north-east Nigeria into Cameroon and Chad. Following a summit in Paris in May – attended by the presidents of Benin, Cameroon, Chad, Niger and Nigeria – France decided to base its counter-terrorist Opération Barkhane in Ndjamena. The Chadian capital is also the headquarters of the regional force, composed of soldiers from those countries at the Paris summit, which is meant to stop Boko Haram fighters from launching cross-border operations. Until early this year, Déby and President Paul Biya of Cameroon regarded Boko Haram as an internal matter for Nigeria alone. However, as the group's military operations have grown in scope and power, it has become more dependent on rear bases in neighbouring countries and this has started to disrupt regional trade between the three countries, with particularly damaging results for the two smaller countries. As the growing security crisis has driven out police units, criminal gangs have moved in to operate in tandem with Boko Haram fighters, launching cattle raids. More recently, there are reports of Boko Haram affiliates in both Chad and Cameroon. Despite these developments, in August senior figures from Boko Haram approached Déby through a trusted intermediary to ask whether he would be willing to broker a ceasefire with Nigeria. He agreed to take the idea forward, consulted former Borno State Governor Ali Modu Sherriff and an impromptu meeting was arranged with President Goodluck Jonathan in Ndjamena (AC Vol 55 No 18, How terror twists the vote). At the centre of the talks was Jonathan's Principal Secretary, Hassan Tukur, regarded as one of the most effective and discreet of officials at the presidency in Aso Rock. When the Chief of Defence Staff, Air Chief Marshal Alex Badeh, announced on 17 October that Nigeria had reached a ceasefire agreement with Boko Haram, it was taken seriously, given the seniority of the Nigerian and Chadian officials involved. Yet as Boko Haram units intensified their attacks in north-eastern Nigeria after Badeh's announcement, many questioned the bona fides of the government's interlocutors. The latest reports from the area suggest several more school children are missing after recent raids and senior politicians in the region predict that many more villages will fall under Boko Haram's control unless there's a far more determined response from Nigeria's military. Last week, a YouTube video clip, claiming to be released under the auspices of Boko Haram's putative leader, Abubakar Shekau, dismissed any talk of a truce and said that the more than 200 schoolgirls abducted from Chibok had been married off (AC Vol 55 No 12, Jonathan faces the north). Nevertheless, senior Chadian and Nigerian officials insist the talks are continuing with credible representatives of Boko Haram. We hear that officials in the National Security Advisor's office have been preparing for the mass release and rehabilitation of detainees, which would be part of a ceasefire and amnesty deal. Even those sceptics who saw the ceasefire claim as preparation for Jonathan's formal announcement on 30 October that he would run again for the presidency next year concede that it could backfire badly if the talks lead nowhere. 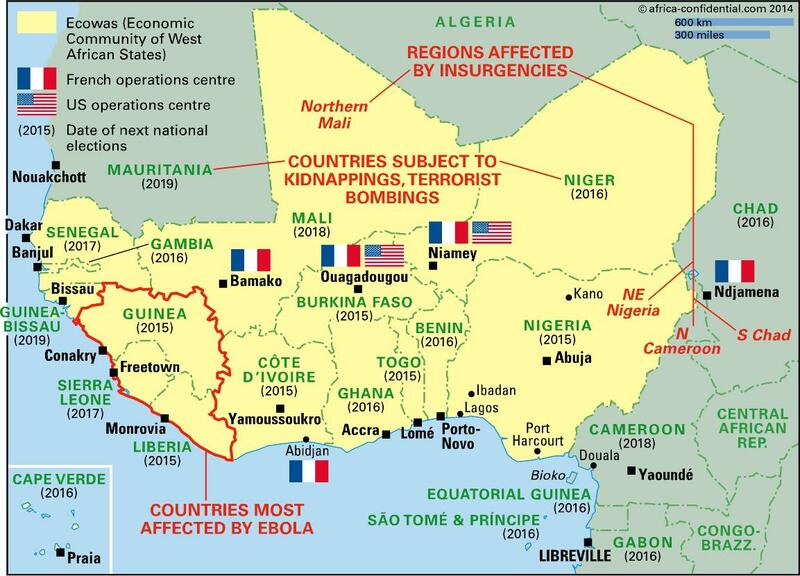 The crises in Mali and northern Nigeria, and other security threats, are undermining much of the economic and political progress in the region over the past decade, turning West Africa's leaders into firefighters racing from one crisis to the next. And the fires are growing fiercer: alongside the insurgencies are failing political systems, some having barely recovered from civil war, declining terms of trade, worsening financial pressures, climate change and now, with Ebola, a major public health crisis, which has momentarily caught international attention (see Feature). Some of the crises have grown out of more positive and longer-term trends. The West African public is stepping up pressure on governments in the region's increasingly open societies. Civil activists frequently question governments' management of oil and gas revenue and demand the disclosure of contracts and tax payments. It was popular agitation, coupled with claims by the former Governor of the Central Bank of Nigeria, Sanusi Lamido Sanusi, that the state oil company had failed to account for US$40 billion in export revenue, that forced President Jonathan to commission a forensic audit of the accounts. The audit is due to be released this month, Finance Minister Ngozi Okonjo-Iweala said in London in October (AC Vol 55 No 21, Follow the money). The business class is growing in strength as it invests in local oil, gas and other mineral resources, and makes tentative steps in rebuilding the manufacturing base that was destroyed by the structural adjustment policies of the 1980s. Not only does West Africa have some of the world's richest reserves of iron ore, oil and gas, along with productive tropical and savannah agriculture and forestry, it is also home to some of the most determinedly entrepreneurial and cosmopolitan mixes of peoples on the continent. Yet it is the prospect of those riches that has sparked many of the region's conflicts over the past three decades, the same conflicts which have undermined economic development. Five years ago, the directors of the International Monetary Fund and World Bank were congratulating West African governments on better macroeconomic management and their handling of the effects of the West's financial crisis. Some sad sirens of Afro-pessimism were quick to seize on the 'Africa Rising' mantra, as banks marketed sovereign bonds to willing buyers in Côte d'Ivoire, Ghana and Nigeria. Now a new set of economic troubles is assailing the region's economies: most immediately threatening for state revenue in Cameroon, Chad, Ghana and Nigeria is the fast-falling international oil price; more widely damaging is the slowdown in China, which has become the leading trading partner for most economies in the region, together with what the IMF Director General Christine Lagarde calls the 'new mediocre' in most other industrialised economies. That means lacklustre growth, and cash-strapped and short-termist governments. The signs are that the IMF and the World Bank are going to be busy in West Africa; their officials speak of the need for economic reforms as big as those in the 1980s. Ghana is trying to agree a three-year reform programme with the Fund but its officials find the levels of public sector spending cuts demanded politically unpalatable. President John Mahama's government faces a tough choice between deep cuts in recurrent costs – with wage cuts and redundancies on the state payroll – and abandoning some much needed capital investment to develop power and water services, said an official close to the talks. By further reducing foreign exchange earnings, the falling oil price is worsening the budgetary problem. Nor is Nigeria, Africa's biggest economy after the latest recalculations, immune from international and local financial pressures as oil prices slump below $80 a barrel. Should the price of its Bonny Light fall below $78 a barrel for a sustained period, the government will have to draw on the $4 bn. left in its Excess Crude Account or simply cut back sharply on its budgeted spending. Either option is problematic for Jonathan's government, less then four months away from general elections. Reflecting these concerns, share prices have been tumbling on the Nigerian Stock Exchange. Nigeria has negotiated oil price crashes before, some of which have forced governments into radical reforms. This time, the question is the effect these economic problems will have on a new breed of national capitalists, such as Aliko Dangote and companies such as Oando and Seplat, as well as on private equity investors from Europe, Asia and the Americas – and on public political feeling. As governments across the region grapple with worsening economic pressures, officials fear that the proposed tough remedies will add to an already long list of discontents: anger at youth unemployment; the increasing cost but unreliability of electricity and water; static or falling wages; rampant corruption and rent seeking by the political and business class. Those political discontents are likely to play out in the sort of street demonstrations seen in the main towns of Burkina Faso last week and, earlier this year, in Côte d'Ivoire, Ghana, Nigeria and Senegal. Across the region, there are an unprecedented number of presidential and parliamentary elections due in the next three years, which could trigger political change or confrontation. The signal from Burkina Faso is that people are no longer waiting for governments to take the initiative. Prepared for Free Article on 25/04/2019 at 03:10. Authorized users may download, save, and print articles for their own use, but may not further disseminate these articles in their electronic form without express written permission from Africa Confidential / Asempa Limited. Contact subscriptions@africa-confidential.com.